The unique way this story is told makes this an interesting read, but even more than that, it made me reflect on issues of race, discrimination and racial profiling. Nora Tucker is looking forward to summer vacation in Wolf Creek--two months of swimming, popsicles, and brushing up on her journalism skills for the school paper. But when two inmates break out of the town's maximum security prison, everything changes. Doors are locked, helicopters fly over the woods, and police patrol the school grounds. Worst of all, everyone is on edge, and fear brings out the worst in some people Nora has known her whole life. Even if the inmates are caught, she worries that home might never feel the same. 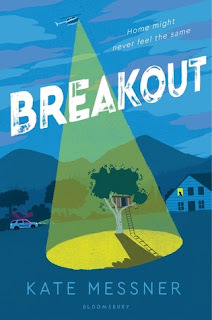 Told in letters, poems, text messages, news stories, and comics--a series of documents Nora collects for the Wolf Creek Community Time Capsule Project--Breakout is a thrilling story that will leave readers thinking about who's really welcome in the places we call home. Breakout, written by Kate Messner, was published by Bloomsbury Children’s Books in 2018. This story hooks you with the mystery and tension of two escaped prisoners. As you read along, it becomes so much more than a prison break story because we get to know the characters in this small town and become invested in their friendships and conflicts. I loved the ingenious way the kids helped to bring in the criminals. One thing to keep in mind – this book took me longer to read than many other middle grade novels. But I’d definitely recommend it, and perhaps will even read it again to get a fuller appreciation of the different perspectives that are struggling against each other in this story. Enclosed is my contribution to the Wolf Creek Community Time Capsule Project. This folder includes my letters as well as public documents and things I’ve collected from friends and family members, shared with permission. This middle grade is unique in the way the story is completely told through notes, letters, news articles, text message transcripts, transcripts of recorded conversations, school announcements, drawings, and poems. There are probably more! I can’t even imagine all the work this took to create a coherent story. Besides that, this story includes characters who are learning about their white privilege, struggling with it and trying to become more sensitive. Those inmates broke out, and it feels like everybody’s acting different now. There is so much to discuss and talk about in this novel! A great book to read to start kids debating issues of fairness, prejudice, being an outsider, race, and reflecting on other people’s perspectives. This book also contains many different poetry styles that could be models for student writing. We talk all the time about being a friendly, welcoming community, but Elidee doesn’t see us that way at all. And if people don’t feel welcome, then maybe we’re not as welcoming as we think. Check out the trailer for this book! What a nice book for a STEM collection! 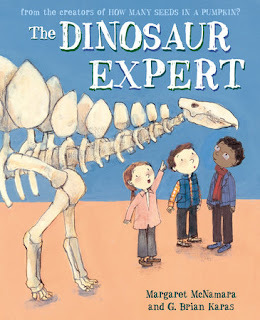 Mr. Tiffin and his students are back in another picture book, and this time the focus is on dinosaur-loving Kimmy. During a field trip to the natural history museum, Kimmy is thrilled to share what she knows about the Stegosaurus and the Archaeopteryx and even the ginormous Titanosaurus. That changes when one of her classmates questions whether girls can be paleontologists. Kimmy starts to feel shy. What if they can’t? What if no one wants to hear what she has to say? It will take some help from Mr. Tiffin–and from a famous scientist–for Kimmy to find her voice again. The Dinosaur Expert was written by Margaret McNamara and illustrated by G. Brian Karas. It was published by Schwartz & Wade Books in 2018. Kimmy collected things so she could study them. This book shows a way to blend factual information into a narrative. There was an obvious message in the text of this story (women can be scientists) but I really liked the way the author included all the facts and details in with the story. Dinosaur lovers will find this book interesting! It’s would be nice to include it in a school library or classroom collection because it showcases women scientists. As a read aloud, I’d use this book to encourage some discussion about women and different occupations and roles. There are interesting dinosaur facts in this story, too. STEM Challenge: Create a collection of something that interests you. Include at least 5 items in your collection and write a label for each item. List: Think of something you know a lot about. Make a list of some interesting things you could share with others. Research: Choose one of the women paleontologists in the back of the book. Try to find out more about her. Imagine: Draw a picture of a dinosaur “field trip.” What would you see? A good story about new beginnings and making friends. Juliet has just moved to a beachside town with her newly separated mother and her moody older sister. When she meets their new neighbor, Emma, the girls form an instant bond. 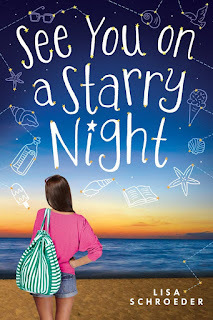 Emma's big family takes Juliet in, and the girls have fun together, starting with the night they throw bottles with secret messages into the sea. Then someone writes back to Juliet's message. An email arrives, inviting her to join the Starry Beach Club. All she has to do is make someone else's wish come true. So Juliet and Emma set off to help as many other people as they can. It's fun! But as Juliet spends more and more time away from home, enjoying her new town and Emma's family more than her own mom and sister, she starts feeling lost. It's been easy to find others to help. But maybe her star would shine a little brighter if she brought it closer to home. 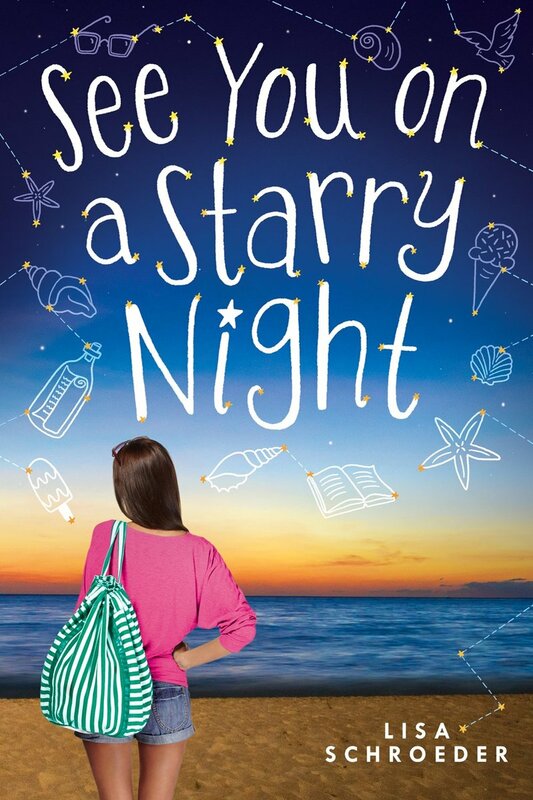 See You on a Starry Night, written by Lisa Shroeder, was published by Scholastic Press in 2018. This is a lovely story about new beginnings – or how to cope when your life completely changes. Juliet’s friendships and feelings are portrayed in a realistic way. This novel follows the everyday experiences of Juliet, but it’s never boring. Small mysteries, interesting details and conflicts create a richly textured story. I appreciated the connections to the art of Vincent Van Gogh. Casper, my old, white, kitty, sat perched on my nightstand, studying me like I might unpack a can of tuna any second. Poor cat. No tuna here, just all of the moving boxes marked Juliet. There are so many great possibilities for activities related to this book: writing a message in a bottle, writing lists using the headings of Juliet’s lists as prompts, finding out the meanings of interesting words, and planning a wish come true for someone like Juliet and Emma do in this story. I really liked the emphasis on doing good deeds and how caring the girls were in this story. But the more time that went by, the more I knew the chances of that happening were really, really small. Smaller than a ladybug’s wing. Smaller than a watermelon seed. Smaller than the tip of a fine-point pen. Start your school year off right with a list of good books to read from Marvelous Middle Grade Monday at Greg Pattridge's blog. What an awesome book for talking about diversity and to use as a model for some really cool art! In the beginning, there were three colors . . .
All special in their own ways, all living in harmony—until one day, a Red says "Reds are the best!" and starts a color kerfuffle. When the colors decide to separate, is there anything that can change their minds? 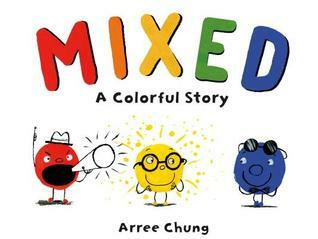 Mixed: A Colorful Story was written and illustrated by Arree Chung. It was published by Henry Holt & Company in 2018. I think this would be a perfect example of what agents and editors mean when they say they are looking for something “fresh.” Colour mixing stories are not new. But even though I predicted that the colors would mix together, I didn’t realize it would happen in such a fun and visually exciting way. I really loved the way the author didn’t dumb down the text and used lovely words such as “vibrant” and “fascinated” and “possibilities.” And I loved the use of speech bubbles to show the character dialogue (awesome, modern design choice). In a way, this reminded me of a modern take on Dr. Seuss’s The Sneetches, but without the rhyming and the machine. (Maybe a good opportunity for comparing and contrasting themes?) I loved how the author drew attention to the feelings of the characters in different situations, through the text and the colours. Lots to discuss here about friendship, community, inclusion and feelings. Design: Use the art style in the beginning pages of the book to draw your own cool town and add a few pops of color. Create a class mural: Day 1 - Students draw elements of a town using black marker and Day 2- Students mix a colour and add themselves somewhere in the town. Explore: Put out paints and give students a chance to mix & name their own new colors. Watch: Arree Chung reads a preview of the book!